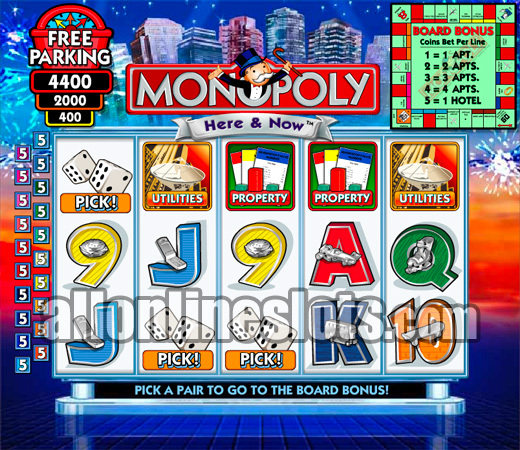 Monopoly - Here and Now is a Wagerworks online slot that is the same as the IGT version of the game found in land-based casinos. Win the board game bonus with three Bonus Board symbols and win prizes with each roll of the dice. The Monopoly - Here and Now video slot celebrates the 70th Anniversary of the world famous board game. 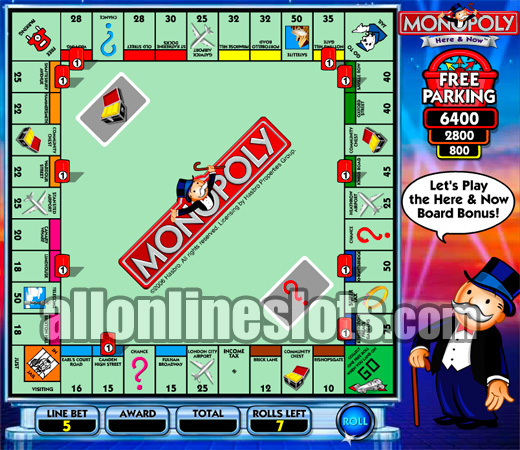 The game uses the popular 5 reel, 20 line format and has a great Monopoly Board bonus game. 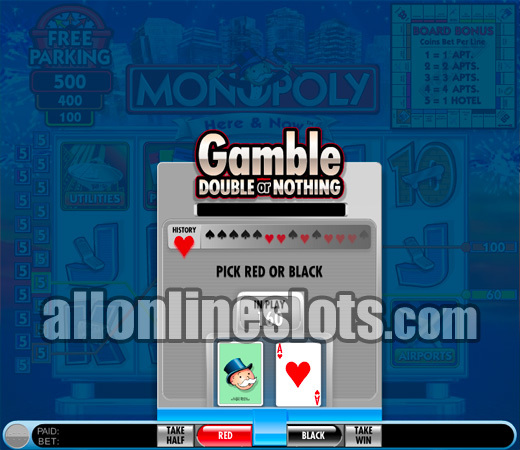 If you are a fan of the board game then you are sure to love this slot machine. First the base game. You have the option of playing up to 20 lines and up to 5 coins per line. The more lines you play the bigger your chances of winning are and the more coins per line you play the bigger the potential wins. Coin sizes start at 1p so with a 100 coin max bet you are looking at just £1 per game. The top jackpot on the reels is 5,000 credits multiplied by your line bet of up to 5. To win the top prize you need to line up either 5 wild symbols, 5 monopoly symbols or a combination of both. At max bet this pays a nice 25,000 credits. Second highest win is 1,000 coins for five Property symbols. Other symbols include Utilities, Airports, Ace through Nine, Free Parking and the Bonus Board symbols. Some of the symbols include a Title Deeds icon. Matching three title deeds earns an upgrade. This adds value to position on the bonus board up to hotels if you are betting max. 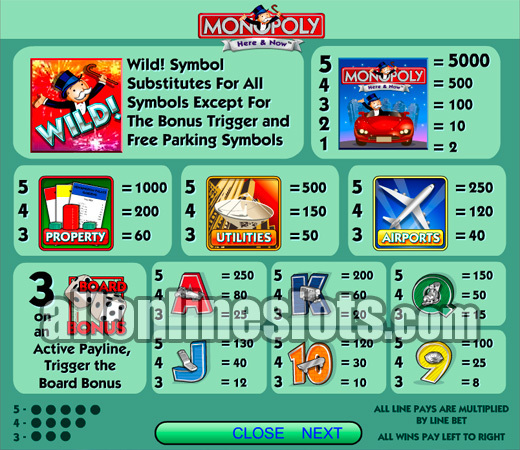 The Free Parking symbols appear on the last three reels and also effect the bonus game. Each time one lands you get extra awards added to the Free Parking section of the bonus game. A red symbols awards 3X your bet, an orange symbol awards 2X your bet and a yellow ads 1X your bet. The great thing about this game is the fact that the longer you go without getting the bonus the bigger the potential winnings on the bonus. To activate the bonus you need to get three Board Bonus symbols on an active pay line. Once hit you have to pick on of the symbols to award your roll amount. You then move on to the bonus board. Click roll to roll the dice and move around the board. Where you land then awards a prize. If you have a hotel or property on that location you get additional awards. 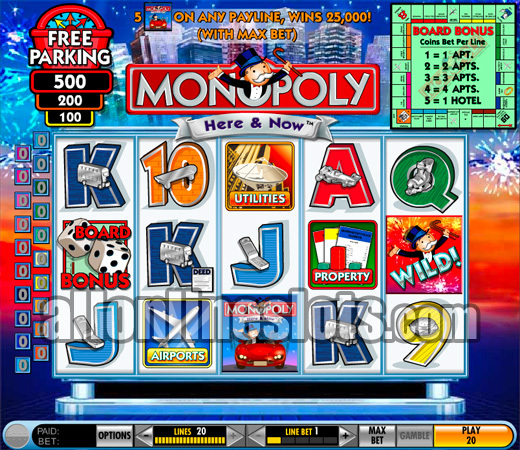 If you land on Free Parking you get one of the three jackpots earned on the reels. (View Screenshot). Once you have used up all of your rolls your bonus wins are added and the bonus ends. Overall this is one of the best non free spin bonus we have seen. It is not surprising that this is one of the most popular video slots in Las Vegas. If you are a fan of the board game it is really a must play.